Lining has become a popular method for repairing damaged pipework. Structural Drain and Pipe Lining offers a full permanent structural repair without the need for unsightly excavations or major disruptions to a site. These can be installed under buildings and applied to domestic, industrial and commercial situations to seal and repair leaks, cracks, open joints, root intrusion and all associated pipe failure. 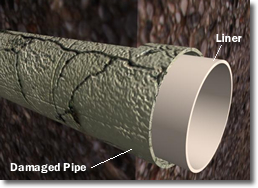 Pipe Lining involves the insertion of a flexible liner that is impregnated with a substanced that when cured forms a rigid internal lining and repair. The lining is guided into place using CCTV then inflated and cured.